For auto body repair, you will need a powerful sprayer that guarantees excellent atomization and a smooth finish. 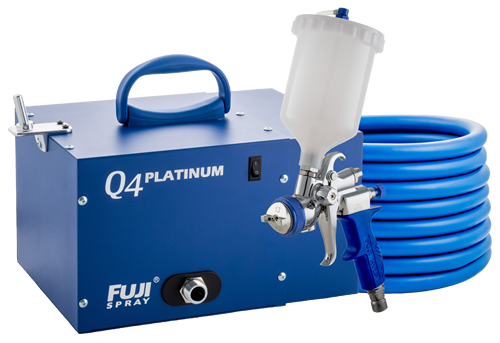 The Fuji Spray® PLATINUM™ models have become THE standard in the auto touchup industry. Multiple gun options and different tip sizes make this series a great choice for automotive spray projects. Overspray is reduced to an absolute minimum. Consider the Mini-Mite PLATINUM™ for mobile use or the Q-PLATINUM™ for your auto body shop. When spraying automotive panels, Fuji recommends a powerful 4-stage or 5-stage turbine. The extra power on the 5-stage provides the push necessary to spray higher viscosity primers. Technological advancements include our patented noise reduction and a proprietary heat dissipation chamber (HDC). The result is a quiet HVLP turbine with the power and precision to lay down a finish that looks exactly as you had envisioned it. If you are working with a compressor in your shop, consider our Fuji Spray® MPX-30™ mid-pressure compressor gun or the LX-20™ HVLP compressor spray gun. The MPX-30™ is lightweight and versatile, allowing you to handle all types of coatings with ease. It is a great solution for applications between conventional high-pressure spray guns and HVLP. 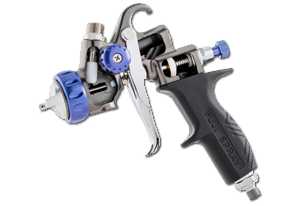 Using only medium pressure (mp) levels similar to reduced pressure (rp) spray guns, the MPX-30™ combines rapid application speed and higher transfer efficiency rates. This spray gun embodies the same familiar controls as any conventional high-pressure spray gun, yet still offering the many benefits of HVLP. The Fuji LX-20™ can handle all types of coatings including high solid materials with ease. This spray gun is designed for use in a production setting. The LX-20™ HVLP technology complies with environmental regulations for HVLP. This added benefit provides considerable savings in material compared to conventional high pressure spraying equipment allowing for little to no dilution for most coatings. The LX-20™ compressor spray gun offers the same benefits of HVLP as our turbine guns. Whether you work with HVLP turbine technology or compressors, you can be assured that Fuji Spray® systems have you covered.